To end the current political crises peacefully, OLF once again would like to show its readiness for negotiation. Such previously attempted negotiation between OLF and the Ethiopian government in the presence of third-party without any precondition has failed due to Ethiopian government failure to show commitment. 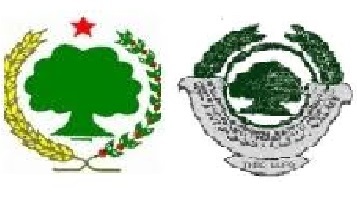 OLF would like to renew its call to the Ethiopian government to initiate such negotiation in the presence of third-party without any precondition and also commit itself to the process. 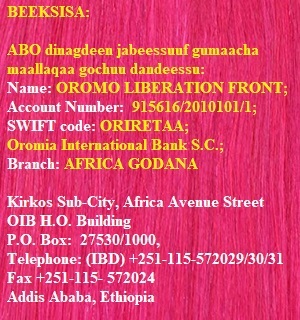 It is clear to everyone that Oromo liberation front (OLF) is an organization that struggles for the freedom and self-determination of the Oromo people. This can only be realized by eliminating the system of oppression that has enslaved the Oromo people and continuously subjected them to untold miseries for more than one-and half century long. The OLF has attempted for a long time at various occasions to find a peaceful solution to the political problem currently facing the empire. However, the intransigent beliefs of the successive Ethiopian regimes to rule the country with military power has continuously ignored our efforts to find solutions to the political crisis now the country is facing. Instead of listening to each other and finding a common ground for the problems, the ruling regimes have chosen to label the OLF as an enemy combatant. Their antidemocratic approach and culture has not only extended the political crises facing the country across generations, but also the sacrifice of lives of countless numbers of people who stand against them for their rights. In 1991, many have hoped that the very archaic Ethiopian political culture that relies on using force and ignores the principle of equality and democracy would come to an end. As a result, many believed, including the OLF, that the solutions to the problems could be sought through a peaceful mechanism. Our willingness and that of many other political organizations who were involved in the arduous struggle that brought the ‘Dergue’ regime to its end has led the public to have a formidable hope that the country’s problem would be solved once and for all. With the understanding that those who stood for the rights of their own people will have no problem in respecting the rights of other peoples, and to make its own contribution in solving the problems peacefully, the OLF has joined the other forces in creating the so called Transitional government. OLF’s participation in the transitional government was primarily to make sure that the rights of the Oromo people get respected. We never had the illusion of sharing power with a dictator to enable a new group to harass the Oromo people, exploit or abuse their resources, or oppress them. This position of OLF has led those forces who had such intentions to a disappointment. Given their self-contradictory objectives that never align with that of ours, war was declared on the OLF and the Oromo people forcing us to quit the transitional government in 1992. 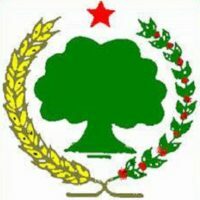 The main reasons that OLF was pushed out of the transition government is that the objectives of the OLF were well received by the Oromo people in a short period of time and their realization of the undeniable fact that in the presence of the OLF it would be extremely hard for them to exploit the Oromo people and their resources. • In 1993 the OLF participated in the Paris Conference initiated by many political parties and opposition that attempted to seek all-inclusive solution that ended in the impressment of Mr. Ibsa Gutama who was one of the founders of the OLF and Minster of Education during the Charter. • While talk was going on February 7-8, 1994 with the initiative of the Carter Center; Aba Gada Boru was called by the government for reconciliation but was killed when he refused to agree to their proposal. Mr. Darara Kafani was also killed in Ambo, western Showa in September 1994. Mr. Darara was a respected, beloved and prominent elder in the area. • A night before the talk organized by Congressional Task Force in Washington DC., on February 6-9, 1994-95, more than 30 people were massacred and several wounded in Surree and Kiyyo villages in Dadar district, eastern Oromia. • In 1996-97 talk was started in Bonn, Germany by the initiative of Ambassador Winkilman who was former Ambassador of Germany and was also in the 1992 attempted talk in Asmara, Eritrea. The Ethiopian delegation withdrew from the talk without notice after two rounds of talk. • Dr. Ismael Noko was assigned by Lutheran World Federation to host talk between OLF and the Ethiopian government which was facilitated by Ambassador Berhnanu Dinka and his elders’ team. The Ethiopian government switched the effort to Elders conference in Addis and frustrated the effort. • Other initiatives by Norwegian Church Aid, KDK group and others are many to list. Although OLF has shown its commitment to these and all related efforts, the Ethiopia government never committed itself to these efforts and as a result all attempts of peacefully seeking solutions to the problems failed. This clearly demonstrates that the TPLF/EPRDF leaders are not ready to solve the crises in a peaceful manner. 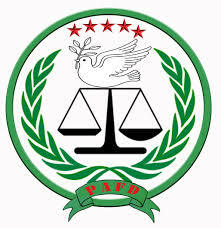 It is now clearer than ever that by distancing themselves from a peaceful negotiation, the TPLF/ EPRDF effort to address the Oromo question in particular through the use of force has failed. It has, instead, led to the Oromo people to stand together in unity and fight for their rights far more than ever. TPLF’s attempts to destroy OLF by declaring war has never succeeded, and rather it strengthened and even led the OLF to be embraced by the Oromo people more than it has ever been. On top of the sacrifices that OLF has paid, by making the objectives of the OLF their own, the Oromo people have also paid heavy scarifies. Thousands of Oromo people have lost their lives, many more have lost their body part and their properties. Over the course of these long years of struggle, filled with a sense of enormity, the actions that the Oromo people would regrettably remember that the pains that have and are being inflicted upon the OLF and the Oromo people by the TPLF are taking place with the full participation of the OPDO. The contribution of the Oromo Youth movement (Qeerroo Bilisummaa Oromo) to the longstanding struggle of the Oromo people has a historical significance. Taking the torch to their hand, and bringing the struggle to the front, the Qeerroo have shaken the enemy to its core. By destroying the roots of the colonizers, their resistance has rattled the enemy with unprecedented pace. Above all, Qeerroo has shown to others the possibility of being organized in the images of the Qeerroo and fight, among other nationalities, against tyranny. This has also shown the strength of the Oromo struggle and has opened a new chapter in the long-standing struggle of the oppressed peoples for democracy in the Ethiopian empire. The Qeerroo have clearly forced the rulers of the empire to understand that no longer will they be able to continue governing the way they were used to do. Today everyone perfectly knows, the terms “change, finding a peaceful solution to problems, self-renewal, and negotiation and others” that are widely talked about within the campus of the EPRDF. To this end, they have appointed a new Prime Minster for the country. The new Prime Minister has also spoken about several opportunities missed in the past and those that availed themselves, particularly when it comes to solving the problems facing the country. However, it should be clearly understood that, other than their growth in depth, the problems facing the Oromo people have not found a resolution, whether now or in the past 27 years of the EPRDF rule. The oppression of the Oromo people and looting of their resources is continuing. Instead of seeking genuine solutions to the problems, the government has chosen to rather pretend or provide empty promises, which will not be accepted either by OLF or the Oromo people. 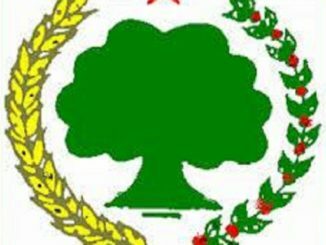 To bring a lasting solution to current political crises of that country, OLF strongly suggests that the Ethiopian government must hold an open and honest dialogue involving all stakeholders, lift the imposed state of emergency once for all, and answer all the demands of the Oromo and other peoples. To end the current political crises peacefully, OLF once again would like to show its readiness for negotiation. Such previously attempted negotiation between OLF and the Ethiopian government in the presence of third-party without any precondition has failed due to Ethiopian government failure to show commitment. 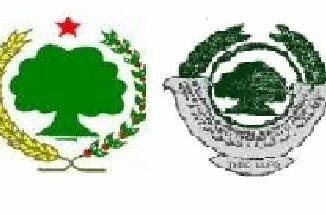 OLF would like to renew its call to the Ethiopian government to initiate such negotiation in the presence of third-party without any precondition and also commit itself to the process. Lastly, OLF would like to call upon all supporters of the Ethiopian government and the international community in general to do your part to solve the current political, social and economic crises that the Ethiopian empire and the peoples are facing. Victory for the Oromo people!